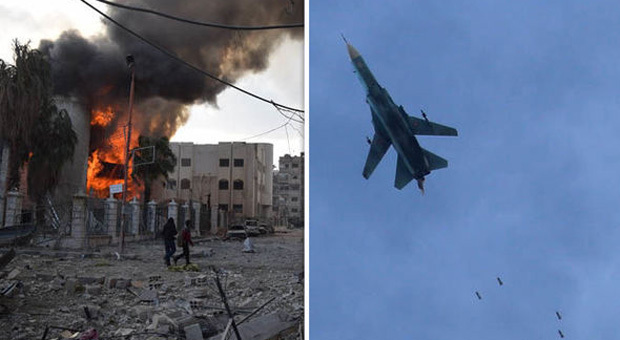 Syrian fighter jets launched a new wave of attacks yesterday ahead of the UN vote on a truce. Syria's government aircraft bombed rebel-held district of Eastern Ghouta on the edge of the capital Damascus for a sixth day running, taking the death toll to 462. According to the British-based independent Syrian Observatory for Human Rights, at least 99 of those killed are children. On top of the dead are hundreds more wounded civilians. Treating the injured is being made almost impossible by air strikes on the 12 hospitals in the area which hold around 400,000 people. One witness reported that the early morning bombing was the most intense to date. UN secretary-general Antonio Guterres said earlier this week that the Syrian government’s bombing had turned the region into “hell on earth” for civilians. Airstrikes are being carried out by Syria's military jets but there have been accusation that they have been joined by Russian bombers. 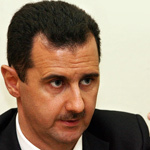 Express reports: Russia is propping up Syria’s brutal president Bashar al Assad in the eight-year-old civil war by providing air and other military support. The two allies claim that they only attack militants and that rebels in Eastern Ghouta have been firing mortars at Government positions in Damascus. The UN Security Council was due to vote on a 30-day Syria-wide truce to let humanitarian relief reach civilians late yesterday afternoon. But it was postponed amid signs of last-minute haggling and fears that Russia could use its veto to block a deal. Russian foreign minister Sergei Lavrov said he could back the resolution drawn up by Sweden and Kuwait – but first needed a guarantee on a ceasefire by rebels. In a statement from Moscow, he said: “There are no guarantees that [the rebels] will not continue shooting at Damascus residential areas. The resolution does not cover terrorist groups such as Islamic State, Al-Qaeda and the Nusra Front which Moscow and Damascus claim they have targeted in Eastern Ghouta. Meanwhile, rebels have vowed not to surrender. Eastern Ghouta has been under siege since 2013.